Maintaining, protecting, and restoring biodiversity and ecosystems. Teachers helping students acquire knowledge, skills, and values essential to living sustain-ably. Nurturing an appreciation of the natural world and an understanding of how nature supports life. We nurture an appreciation of the natural world in our students through a variety of means. While this varies in depth and scope at each step, some opportunities and activities are common across the step levels. First and foremost, we give our students frequent opportunities to play in and explore the outdoors. Our students also nature journal, read and write about the natural world, and visit beautiful places. We recognize that having frequent opportunities to bond with the natural world nurtures children’s physical, cognitive, and emotional health and development. Students’ understanding of the natural world and its systems is further developed through observation and scientific studies. 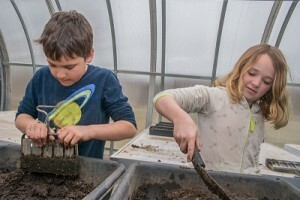 Hands-on explorations are an integral part of The Compass School’s authentic education. This is accomplished through practicing scientific inquiry and exploratory activities in and outside of the classroom. Field trips and guest speakers are used to ensure that student learning is authentic and rewarding. Students take their newly acquired knowledge and begin to analyze how humans relate to the natural world—both positively and negatively. Topics covered in classroom discussions are applied to real life situations, and the cause and effect of human relationships with the natural world are discussed. In-depth topics of study differ at each step level and include consumer waste and energy. Each year, student learning culminates in a school-wide Eco-Fair in which students educate the broader community through interactive booths and experiments. School-wide sustainability practices are also modeled and encouraged to help ensure that future generations’ needs are met. These practices include composting, using non-disposable items, packing no-waste lunches, and recycling. 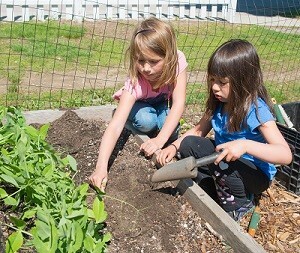 All students also participate in an ongoing whole-school project – our school garden – to learn about sustainable principles of agriculture and to provide a means for fostering community and connection to the natural world.